This flavorful, easy, homemade pasta salad combines fresh, simple ingredients and a quick dressing to create the perfect pasta salad recipe! I have always loved a good pasta salad. 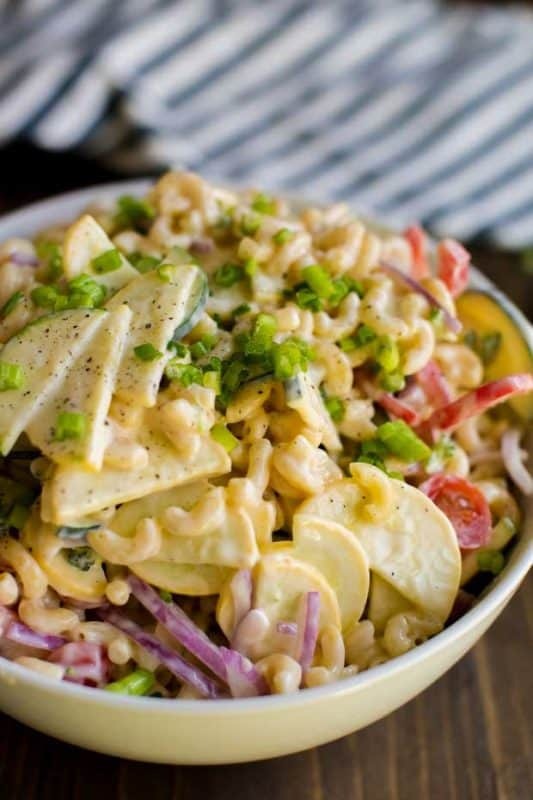 The fresh, crunchy veggies mixed with tender, al dente pasta and a quick, homemade dressing offers a yummy, flavorful side dish that can easily become a meal. The pasta salad recipe I’m sharing with you today is a favorite for our family. I can assure you, I’ve tried a lot of pasta salad recipes over the years and I think this one’s the best! 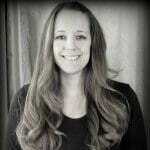 On a recent shopping trip to Walmart, I was inspired in the produce section to pull out this yummy recipe so I could enjoy all the fresh veggies they had to choose from. Did you know that your local Walmart is a great place to get seasonal, locally grown produce from a variety of partner farms? It’s true! I love that my store has clear signage in the produce section so I know which items are grown locally. Of course, what’s offered from local farms varies by region, so check out your store to find out what’s in season right now! They also back their fresh produce with a 100% money back guarantee so you can buy with confidence. If you’re not totally satisfied with the produce, bring back your receipt for a full refund. No questions asked and you don’t even need to bring back the produce. Walmart is committed to making food healthier and more affordable. As part of this promise, Walmart has already saved customers more than $2.3 billion over the last two years on fresh fruits and vegetables in produce sections across the country. If you’re always busy like me, you can utilize Walmart’s grocery pickup service as well. Let me tell you: it’s a game changer. You order everything online from the comfort of your home (or office!) and can pick up that same day. You’ll be delighted with the great value, friendly service and fresh groceries — all on your schedule without leaving your vehicle! Let’s talk a little about the best pasta salad recipe, all inspired by the fresh veggies I saw while shopping. Their beautiful colors are just begging to be enjoyed. You eat with your eyes first and this vivid veggies won’t disappoint. If you’ve never had any pasta salads, you’re missing out. A staple during summer cook outs, they’re a must-have at our house year-round. Pasta salads are prepared with one or more types of pasta and are usually served cold. Most pasta salad recipes have a dressing made of vinegar and oil or a mayonnaise based dressing. A variety of fresh veggies are included and sometimes meats such as pepperoni are added as well. Italian pasta salad with pepperoni, peppers and olives are a favorite for us! It can be served as an appetizer, side dish or a main course. 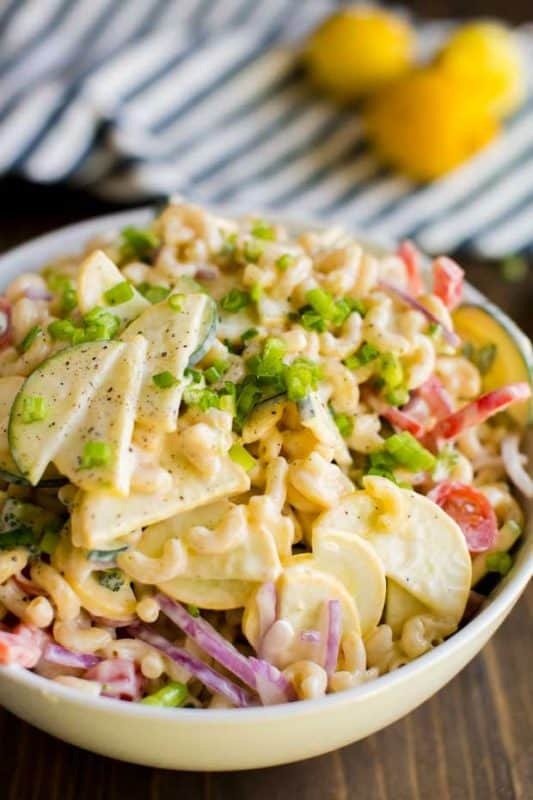 There are so many different varieties, and you’re sure to find a pasta salad recipe you love. 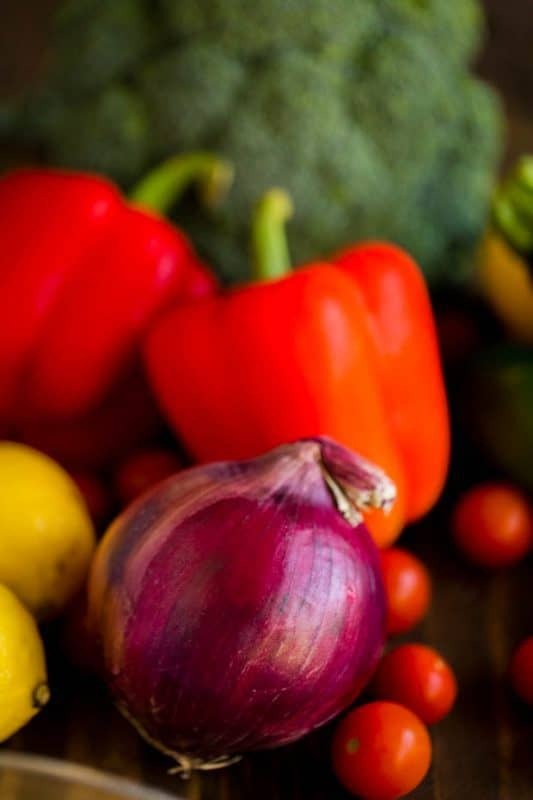 Check out the fresh produce at Walmart to help you decide what to include in yours! Cut the squash and zucchini in half length-wise. Cut into half-moon shapes that are ¼ inch thick. Cut the top off the red pepper and cut the pepper into round slices 1/8 inch thick. Then cut the round slices into 4 pieces. Cut the broccoli into small bite size pieces. Cut the red into half-moon slices and then cut in half. 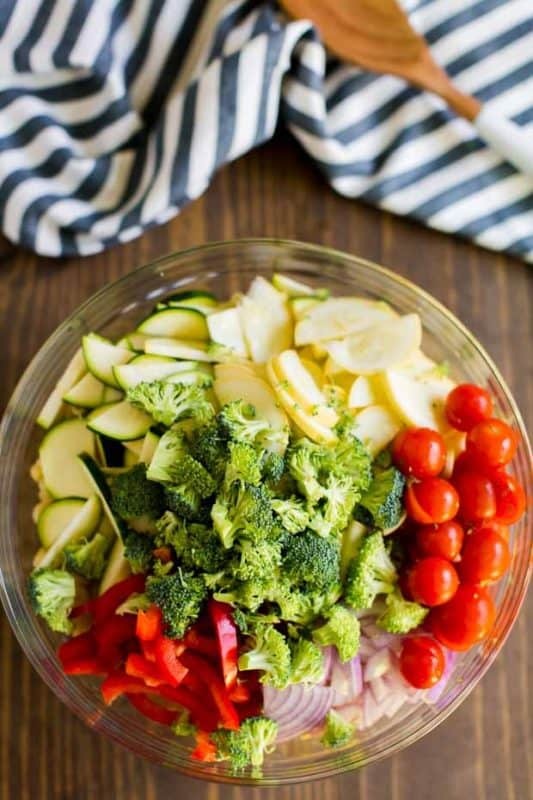 Place all veggies in a large bowl with cooled macaroni. In a separate bowl, whisk together whipped dressing, sugar, lemon juice, lemon zest and pepper. Pour over the top of the pasta and veggies and toss to coat. Garnish with more fresh cracked pepper and green onions. Chill until ready to serve. I love how quick and easy this is to make – less than 20 minutes total. 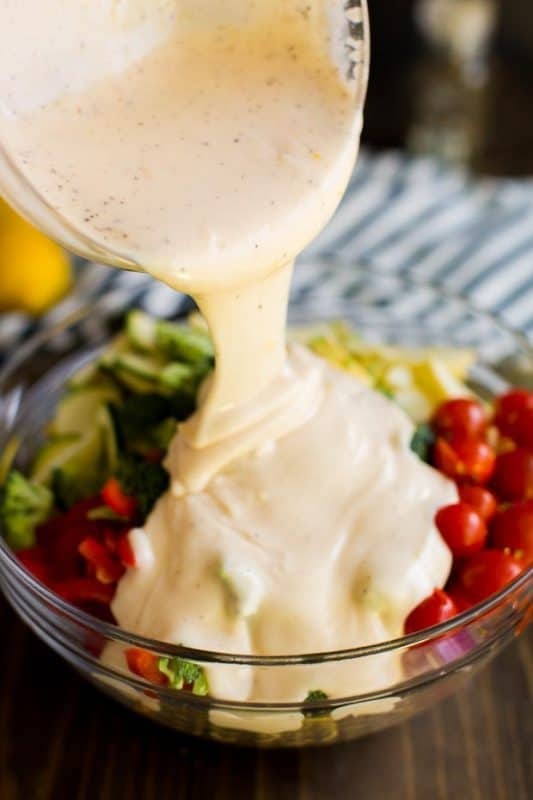 The simple homemade dressing is so good – I sneak a bite of it while mixing because I enjoy it so much! 😉 I love how creamy it is. It’s a nice compliment to the crisp, fresh veggies. The bright colors make my mouth water! I hope you find produce you love the next time you visit Walmart and are inspired to enjoy this pasta salad with your family soon. We love this delicious, simple pasta salad year round in our family! Cut the squash and zucchini in half length-wise. Cut into half moon shapes that are ¼ inch thick. Cut the red into half moon slices and then cut in half. I don’t understand “whipped dressing” either. There is nothing in the recipe ingredients to whip. Are you meaning salad dressing like “Miracle Whip”? Yummy…looking pasta I am feeling Hungary after seeing this.thanks for sharing…keep sharing such a good and innovative recipes. Hi, Carolina – it’s actually included right in the recipe. Hope you enjoy!